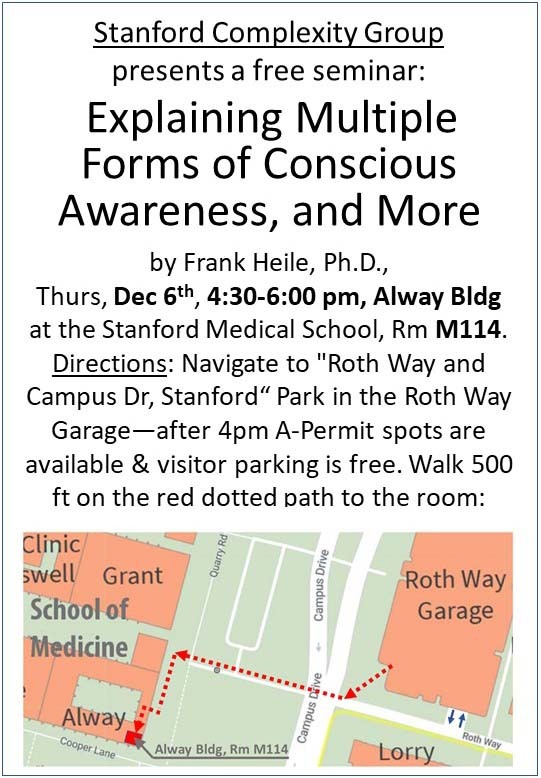 On Thursday, Dec 6th at 4:30 pm at a meeting of the Stanford Complexity Group. The announcement and abstract of this talk are located here. This is a 90-minute talk and it is free! The talk will be in the Alway building of the Stanford Medical School in room M114. There should be plenty of free parking in the Roth Way parking structure at the corner of Roth Way and Campus Drive. After 4 pm visitor parking is free and A-Permit spots are available to everyone. Detailed directions and a map showing how to get from the parking structure to the lecture room is available here. Free dinner will be available after the talk, but please RSVP by emailing StanfordComplexity (at) gmail.com so we have enough food. .If you are a member of a group and if you would like Frank to speak at one of your events, please Contact him. Frank led a one hour breakout session at the Transformative Technologies Conference in Palo Alto, CA. Frank gave a 25-minute talk at the Science and Nonduality Conference in San Jose. The video of that talk is here. Frank presented a poster at the Stanford Neurosciences Institute Symposium. The content of the poster is here. Frank spoke at the Foundation for Mind/Being Research (FMBR) meeting at Unity Palo Alto, The video of the talk is here. Frank talked at the Regional Gathering (RG) of the San Diego Mensa Group at 12:45 for an hour. This talk was a subset of the talk given the night before, so no video has been produced. Frank spoke at a concurrent session of The Science of Consciousness Conference in Tucson, Arizona. The 20-minute video of this talk is here. Frank was the featured Sunday Brunch speaker at the San Francisco Regional Mensa Gathering in Emeryville, CA. You can watch the 43-minute video of this talk here. This talk fully integrated Attention Schema Theory (AST) with the three-agent model. AST provides both an awareness model and a self-awareness model for each of the three agents which gives the most compelling explanation of spirituality so far! This is the third presentation at various Mensa events, and the 30th presentation so far! Friday, October 20th, 2017 – Noon to 12:20 pm. Frank spoke at the Science and Nonduality Conference in San Jose, CA, from Noon to 12:20 pm. You can watch the video of this talk here. In this talk, Frank combined Attention Schema Theory with the three-agent model to get a more compelling explanation of spirituality. This is the ninth presentation done at this series of conferences. Frank presented a poster at the Stanford Neurosciences Institute Symposium. The poster that will be presented is here. Frank spoke at the Mensa Annual Gathering in Hollywood, Florida from Noon to 1:15 PM. The edited video of this talk was combined with they the July 30th talk and is shown in this playlist of 8 short videos. This is the second presentation at various Mensa events. Frank spoke in San Jose at a Meetup of the Humanist Community of Silicon Valley. The edited video of this talk was combined with they the July 7th talk and is shown in this playlist of 8 short videos. Frank spoke for 20 minutes at The 2017 Science of Consciousness Conference in San Diego, CA. This was the seventh presentation I have done for this series of conferences. Frank spoke for 40-minutes at the San Francisco Consciousness Hacking Meetup. This was the most pedagogical and understandable presentation of the basic parts of this model of consciousness and spirituality – see the video and PDF of this talk on the Resources tab. This is the third presentation to a Consciousness Hacking Meetup. Science and Nonduality Conference in San Jose, CA. 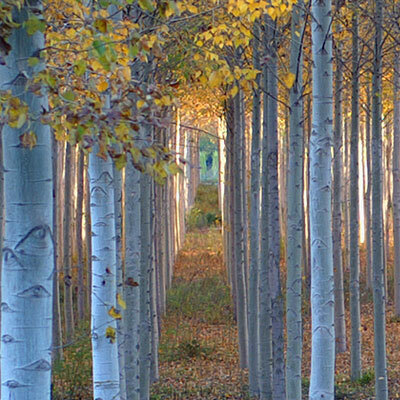 The 20-minute concurrent session talk is titled A Three Agent Model of Consciousness Explains Multiple Nondual Enlightened States – see the video and PDF of this talk on the Resources tab. This is the eighth presentation at this series of conferences. Stanford Neurosciences Institute 2016 Symposium – Poster session at Stanford University. The poster is titled A Model of Consciousness May Explain Spiritually Enlightened States – see the image of the poster on the Resources tab. Towards a Science of Consciousness Conference in Tucson, AZ. A poster was presented. This is the sixth presentation I’ve done at this biannual conference. Science and Nonduality Conference in San Jose, CA. A poster was presented. This is the seventh presentation I have done at this conference – several were concurrent session talks; the rest were poster sessions. Atheist Community of San Jose Meetup – 1-hour presentation – the video of this talk is available here. This is the first video of Frank’s talks that is available on YouTube and this website. This is the third presentation at Atheist Clubs. Mensa Annual Gathering – 1-hour presentation in Louisville Ky. This is the first of 4 presentations to various Mensa groups. Atheist Club – 1-hour presentation in Berkeley. The third presentation at Atheist Clubs..
2014 – Atheist Club – 1-hour presentations in Walnut Creek. The first of 3 presentations at Atheist Clubs. 2014 – Consciousness Hacking Meetup – 2 presentations – Santa Cruz and San Francisco. This was the first two of 3 presentations at Consciousness Hacking Meetups. 2009 – Bay Area AI Meetup – a 1-hour presentation in Redwood City.